Today’s good news: companies have gotten the message that single-use plastic is bad for the oceans, bad for wildlife, bad for the environment and—most importantly—bad for business. Some are eliminating the plastic they use for packaging to keep plastic pollution out of the waste stream right at the beginning. 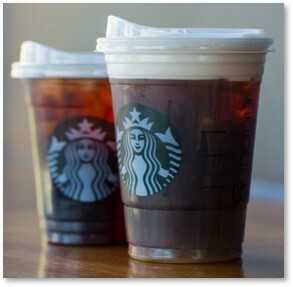 S tarbucks, makers of premium overpriced coffee, will roll-out new lids for cold beverages this summer. Although these lids are still plastic, they do away with plastic straws and use 9% less plastic than the old lid-and-straw combination. Last year, the company said it would phase out single-serve plastic straws by 2020 except on request and this appears to be the first step. While 9% is not a huge number, every contribution makes a difference. The National Park Service tells us that plastic straws are the sixth most common trash item on beaches, even though they make up less than 4% of the plastic waste in landfills. Dunkin’ Brands, makers of the coffee most New Englanders drink, has begun phasing out white Styrofoam cups and replacing them with double-walled paper cups instead. They can’t do this fast enough for me as I always wonder how much of that polystyrene is leaching into my hot coffee. Ben and Jerry’s, makers of premium ice cream in unusual flavors, have announced that they will phase out plastic straws and spoons in 600 stores worldwide by April. They will replace the 2.5 million plastic straws and 30 million plastic spoons used every year with wooden spoons and paper straws on request. 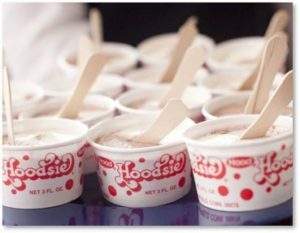 To those of us who grew up eating ice cream out of paper Hoodsie Cups with flat wooden spoons, this is welcome news. Ben and Jerry’s also plans to replace plastic cups and lids so the company can get rid of those by 2020. Carlsberg Brewing has replaced those evil plastic six-pack rings with glue dots that hold the beer cans together. McDonald’s, makers of fast burgers and pretty good fries, has decided to ensure that 100 percent of its packaging comes from renewable, recycled or certified sustainable sources by 2016. They will stop using plastic straws in the United Kingdom and Ireland. Burger King, scrabbling to keep up with McDonald’s, is making all its UK packaging recyclable by 2025. What, not in the US? Are we chopped liver or something? Red Lobster only offers plastic straws upon request in its 600 restaurants and will replace them with more eco-friendly alternatives by 2020. I assume they’re using up their inventory as paper straws are available right now. Hyatt Hotels said last year that they would provide plastic straws at their properties only on request. This makes me happy as it sets a good example. I don’t always remember to say, “No straw, please” and then go “Duh!” when my drink arrives with a straw. Alaska Air Group Inc. has committed to replacing non-recyclable stirring straws and picks with “sustainable, marine-friendly alternatives.” I’m not sure what constitutes marine friendly but I think anything that doesn’t stick in a turtle’s nose is a step in the right direction. American Airlines, makers of extremely uncomfortable airplane seating, is phasing out single-use plastic items in their airport lounges. United Airlines has banned plastic straws and stirrers from its flights. The Walt Disney Company has banned plastic straws and stirrers from all its theme parks and resorts, eliminating the 175 million plastic straws and 13 million stirrers used at the company’s locations each year. Washington DC has banned plastic straws. San Diego has banned polystyrene (Styrofoam) food and drink containers, egg cartons, ice-chest coolers, aquatic toys for swimming pools, mooring buoys and navigation markers. California has implemented a partial ban on plastic straws at dine-in restaurants, which can provide them on request only. Seattle has banned the use of plastic straws and stirrers in bars and restaurants starting July 1 of this year. Plastic wrappers from magazines, snacks, cigarette packs, etc. Plastic bottle and carton caps, which are deadly for sea life. Plastic bottles. Less than three in 10 are recycled after being used just once. Beverage cans from soda, beer, alcohol, and bubbly water. 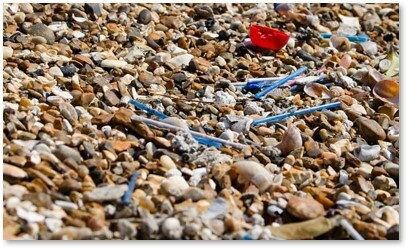 Plastic straws and stirrers. Americans use 500 million of these items every day. Glass bottles. These will eventually erode back into sand but are dangerous until then. 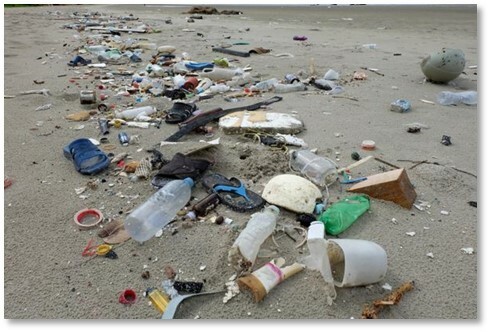 Plastic or Styrofoam packaging, including yogurt cups, Tupperware, and beverage cups. Solo Cup Co., are you listening? Now, people don’t always throw these items off boats of leave them on the beach. (Cigarette butts excepted. Smokers: the beach is not your ashtray.) Unless you pack trash back home to be picked up or recycled responsibly, however, the wind and rain will do that job for you. Plastic bag, are light and easily blown around although lots of other trash gets carried by the wind or is carried on streams of rainwater. I personally think we need to find a way to convert plastic waste into energy quickly and cheaply. Then we can see a real advantage to recycling the waste stream. This would also persuade people to scavenge plastic waste and sell it back to the energy plant the way people now scavenge returnable cans and bottles to collect the $.05 refund per item. 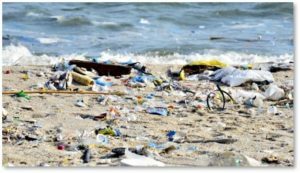 Here’s the bad news: we are seeing more of the impact plastic waste has on marine life as it works its way up the food chain. 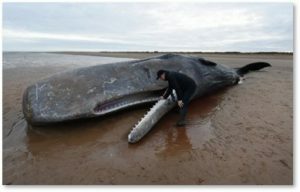 Dead whales have begun washing up on beaches and their stomachs are filled with plastic. A juvenile male curvier beaked whale washed up in the Philippines with 88 pounds of plastic trash inside its body. It died of dehydration and starvation. Park officials discovered the carcass of a sperm whale in the waters near Indonesia’s Wakatobi National Park with a large plastic mass in its stomach. 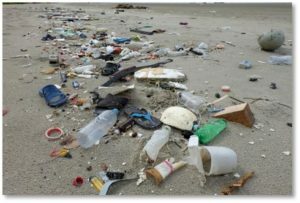 This included 115 plastic cups, four plastic bottles, 25 plastic bags, two flip-flops, a nylon sack and more than 1,000 other assorted pieces of plastic. A dead sperm whale washed up on the southern coast of Spain with 29 kilos of plastic in its gut, including plastic bags, netting and a jerry can. A necropsy determined that it died from peritonitis. Swapping plastic containers with glass ones is better for your health as well as for the environment. I have not been as good at this as I want to be. My kitchen still contains plastic sandwich and snack bags as well as plastic wrap. But I’m working on it. On the other hand, I don’t use anywhere near as much plastic wrap as exhibit companies do for trade shows. I do refuse plastic bags — or any kind of bag if I can just carry the purchase out with me. If you have never worked install-and-dismantle for a trade show, you have never seen the giant pallets of materials wrapped over and over in plastic wrap to keep them safe during shipping. They cut off and discard this wrap at either end. For every show. Many times a year. I always found it dismaying to walk onto a trade show floor and see acres of these enormous plastic cocoons. Maybe someday I&D companies will get the same message as consumer companies are hearing. Environmentalism can be good for business and more businesses are responding every year. This gives us cause for hope. We have stop putting millions of tons of plastic in the waste stream every year. We have to clean up what’s already out there. And we have to protect marine life from our careless exploitation of the only planet we all have for fun, profit, and ease of use.